References m_bCancelled, m_bIsSelection, m_bSkipWord, m_iEndLength, m_iStartIndex, m_iWordLength, m_iWordOffset, m_pChangeAll, m_pCurrBlock, m_pCurrSection, m_pEndBlock, m_pEndSection, m_pIgnoreAll, m_pPreserver, m_pStartBlock, m_pStartSection, m_pView, and m_pWord. References _purgeSuggestions(), FV_View::cmdUnselectSelection(), DELETEP, UT_GenericStringMap< T >::freeData(), FV_View::isSelectionEmpty(), m_bIsSelection, m_iOrigInsPoint, m_pChangeAll, m_pIgnoreAll, m_pPreserver, m_pView, m_pWordIterator, and FV_View::moveInsPtTo(). Referenced by _spellCheckWord(), addIgnoreAll(), addToDict(), changeWordWith(), and nextMisspelledWord(). References DELETEP, UT_GenericVector< T >::getItemCount(), UT_GenericVector< T >::getNthItem(), and m_Suggestions. Referenced by AP_Win32Dialog_Spell::_tryAgain(), nextMisspelledWord(), AP_UnixDialog_Spell::runModal(), and ~AP_Dialog_Spell(). References FREEP, UT_GenericStringMap< T >::insert(), m_pChangeAll, m_pWordIterator, UT_calloc(), UT_return_val_if_fail, UT_UCS4_strcpy(), UT_UCS4_strlen(), and UT_UCS4_strncpy_to_char(). Referenced by AP_Win32Dialog_Spell::_changeAll(), and AP_UnixDialog_Spell::onChangeAllClicked(). References _getDict(), SpellChecker::ignoreWord(), m_iWordLength, and m_pWord. Referenced by AP_Win32Dialog_Spell::_onCommand(), and AP_UnixDialog_Spell::onIgnoreAllClicked(). References _getDict(), SpellChecker::addToCustomDict(), m_iWordLength, and m_pWord. Referenced by AP_Win32Dialog_Spell::_onCommand(), and AP_UnixDialog_Spell::onAddClicked(). References _getDict(), FL_SelectionPreserver::cmdCharInsert(), SpellChecker::correctWord(), m_bIsSelection, m_iEndLength, m_iWordLength, m_pCurrBlock, m_pEndBlock, m_pPreserver, m_pView, m_pWordIterator, makeWordVisible(), FV_View::updateScreen(), and UT_UCS4_strlen(). Referenced by AP_Win32Dialog_Spell::_change(), AP_Win32Dialog_Spell::_changeAll(), inChangeAll(), AP_UnixDialog_Spell::onChangeAllClicked(), and AP_UnixDialog_Spell::onChangeClicked(). Referenced by AP_Win32Dialog_Spell::_onCommand(), AP_UnixDialog_Spell::onAddClicked(), AP_UnixDialog_Spell::onIgnoreAllClicked(), and AP_UnixDialog_Spell::onIgnoreClicked(). References changeWordWith(), FREEP, m_pChangeAll, m_pWordIterator, makeWordVisible(), UT_GenericStringMap< T >::pick(), UT_calloc(), UT_return_val_if_fail, and UT_UCS4_strncpy_to_char(). References FV_View::cmdUnselectSelection(), FV_View::extSelHorizontal(), fl_BlockLayout::getPosition(), m_iWordLength, m_iWordOffset, m_pCurrBlock, m_pView, FV_View::moveInsPtTo(), and FV_View::updateScreen(). Referenced by AP_Win32Dialog_Spell::_onInitDialog(), AP_Win32Dialog_Spell::_tryAgain(), changeWordWith(), inChangeAll(), nextMisspelledWord(), and AP_UnixDialog_Spell::runModal(). References _getDict(), _purgeSuggestions(), _spellCheckWord(), UT_GenericVector< T >::addItem(), AP_PREF_KEY_AutoSpellCheck, FL_DocLayout::bgcrSpelling, SpellChecker::checkWord(), DELETEP, XAP_Dialog::getApp(), XAP_Prefs::getCurrentScheme(), fl_SectionLayout::getDocLayout(), UT_GenericVector< T >::getItemCount(), FV_View::getLayout(), fl_ContainerLayout::getNextBlockInDocument(), UT_GenericVector< T >::getNthItem(), XAP_Prefs::getPrefsValueBool(), inChangeAll(), m_bIsSelection, m_bSkipWord, m_iEndLength, m_iStartIndex, m_iWordLength, m_iWordOffset, m_pCurrBlock, m_pCurrSection, m_pEndBlock, m_pView, m_pWord, m_pWordIterator, m_Suggestions, makeWordVisible(), SpellChecker::suggestWord(), UT_ASSERT_HARMLESS, and UT_return_val_if_fail. Referenced by AP_Win32Dialog_Spell::_tryAgain(), AP_Win32Dialog_Spell::runModal(), and AP_UnixDialog_Spell::runModal(). 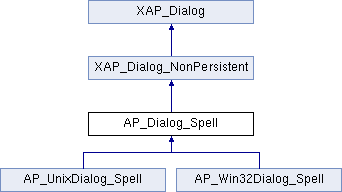 Implemented in AP_UnixDialog_Spell, and AP_Win32Dialog_Spell. References FV_View::getBlockAtPosition(), fl_BlockLayout::getDocSectionLayout(), FL_DocLayout::getDocument(), FV_View::getDocumentRangeOfCurrentSelection(), fl_ContainerLayout::getFirstLayout(), FL_DocLayout::getFirstSection(), XAP_Frame::getFrameData(), FV_View::getPoint(), fl_BlockLayout::getPosition(), FL_DocLayout::getView(), FV_View::isSelectionEmpty(), m_bIsSelection, m_bSkipWord, m_iEndLength, m_iOrigInsPoint, m_iStartIndex, m_pChangeAll, m_pCurrBlock, m_pCurrSection, m_pDoc, AP_FrameData::m_pDocLayout, m_pEndBlock, m_pEndSection, m_pFrame, m_pIgnoreAll, PD_DocumentRange::m_pos1, PD_DocumentRange::m_pos2, m_pPreserver, m_pStartBlock, m_pStartSection, m_pView, m_pWordIterator, and UT_return_if_fail. Referenced by AP_Win32Dialog_Spell::_onCommand(), AP_Win32Dialog_Spell::_tryAgain(), AP_Dialog_Spell(), AP_Win32Dialog_Spell::runModal(), and AP_UnixDialog_Spell::runModal(). Referenced by AP_Dialog_Spell(), changeWordWith(), nextMisspelledWord(), runModal(), and ~AP_Dialog_Spell(). Referenced by AP_Dialog_Spell(), ignoreWord(), nextMisspelledWord(), and runModal(). Referenced by AP_Dialog_Spell(), changeWordWith(), nextMisspelledWord(), and runModal(). Referenced by runModal(), and ~AP_Dialog_Spell(). Referenced by AP_Win32Dialog_Spell::_change(), AP_Win32Dialog_Spell::_changeAll(), AP_Win32Dialog_Spell::_onCommand(), AP_Win32Dialog_Spell::_showMisspelledWord(), and AP_Win32Dialog_Spell::_suggestChange(). Referenced by AP_Dialog_Spell(), nextMisspelledWord(), and runModal(). Referenced by addIgnoreAll(), addToDict(), AP_Dialog_Spell(), changeWordWith(), makeWordVisible(), and nextMisspelledWord(). Referenced by AP_Dialog_Spell(), makeWordVisible(), and nextMisspelledWord(). Referenced by addChangeAll(), AP_Dialog_Spell(), inChangeAll(), runModal(), and ~AP_Dialog_Spell(). Referenced by AP_Dialog_Spell(), changeWordWith(), makeWordVisible(), nextMisspelledWord(), and runModal(). Referenced by AP_Dialog_Spell(), and runModal(). Referenced by AP_Dialog_Spell(), runModal(), and ~AP_Dialog_Spell(). Referenced by AP_Dialog_Spell(), changeWordWith(), runModal(), and ~AP_Dialog_Spell(). Referenced by _getDict(), AP_Dialog_Spell(), changeWordWith(), makeWordVisible(), nextMisspelledWord(), runModal(), and ~AP_Dialog_Spell(). Referenced by addIgnoreAll(), addToDict(), AP_Dialog_Spell(), and nextMisspelledWord(). Referenced by AP_Win32Dialog_Spell::_showMisspelledWord(), AP_UnixDialog_Spell::_updateWindow(), addChangeAll(), changeWordWith(), inChangeAll(), nextMisspelledWord(), runModal(), and ~AP_Dialog_Spell(). Referenced by AP_Win32Dialog_Spell::_change(), AP_Win32Dialog_Spell::_changeAll(), AP_Win32Dialog_Spell::_onCommand(), _purgeSuggestions(), AP_Win32Dialog_Spell::_showMisspelledWord(), AP_Win32Dialog_Spell::_suggestChange(), AP_UnixDialog_Spell::_updateWindow(), nextMisspelledWord(), and AP_UnixDialog_Spell::onSuggestionSelected().